#57 is Rocky, which with its rags-to-riches story and production tale managed to beat out other AFI honorees Network, All the President's Men and Taxi Driver for the top Oscar prize (the only Best Picture nominee that didn't make this list is Bound for Glory, which I probably have to see now just on principle). 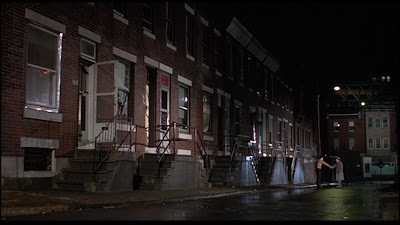 The film had a budget of less than a million dollars, and took a huge risk by casting a then-unknown actor named Sylvester Stallone in the lead role, but it went on to make $225 million and won three Oscars (eerily similar to the next movie on the list, Jaws). We Americans sure do love our Cinderella stories. Cuisine: Homemade spinach, tomato and leek soup with goat cheese and garlic bread ... mmm ... fall. 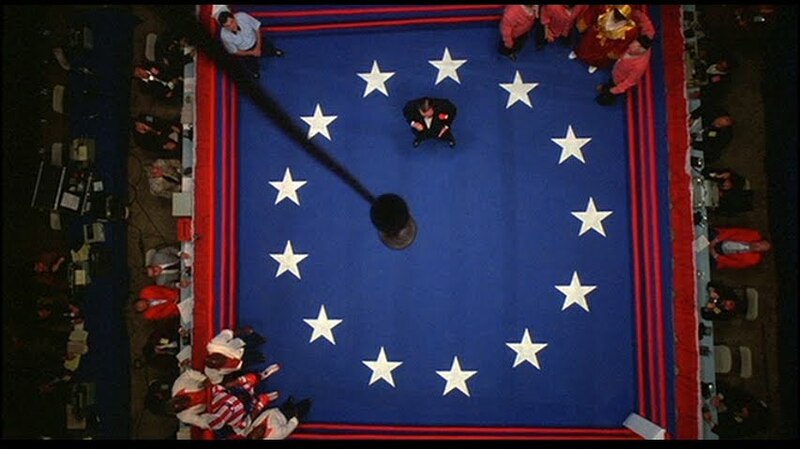 The film opens on the word ROCKY, which scrolls by the screen, too large to fit all at once: an omen of what's to come. 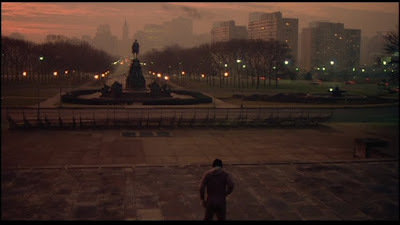 Rocky Balboa (acting AND screenwriting Oscar nominee Sylvester Stallone -- honors that only he, Charlie Chaplin and Orson Welles have received in the same year) is a sometime boxer who is a down-and-out debt collector on the side, a guy with huge potential who never got his big chance... that is, until reigning world heavyweight champion Apollo Creed (Carl Weathers! From "Arrested Development!") needs a last-minute replacement sparring partner for an upcoming match. 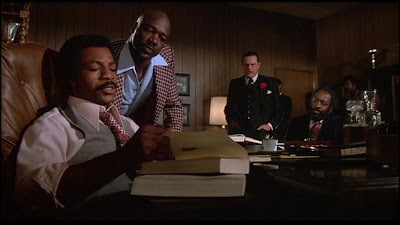 He chooses the Italian Stallion, mostly on the basis that "Apollo Creed vs. the Italian Stallion" sounds like "a bad monster movie." This worldwide celebrity seems like a shoe-in to win against a single guy who talks to his pets in his way-too-small apartment. 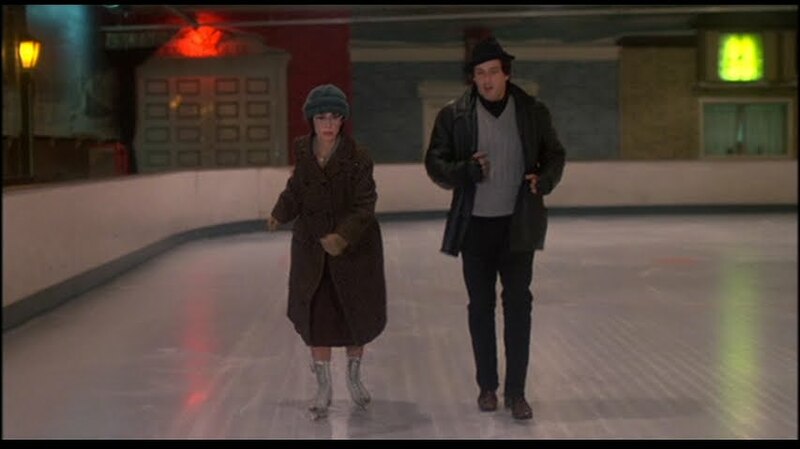 In fact, everything in Rocky's life seems too small for him, including the girl he develops a crush on, Adrian (the wonderful Oscar nominee Talia Shire), who he woos by taking her to a skating rink which has closed down for the night. According to history, the production team didn't have the money to hire extras to film a scene in the rink, so they did it after the place closed. Genius. Shoestring. And it makes this scene so much more intimate, and allows Rocky's mumbly jumbles to take focus. 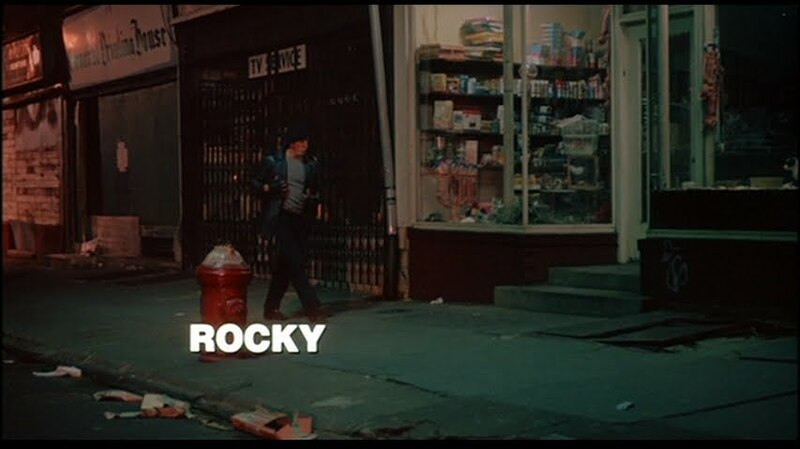 More often than you'd hope, you can barely understand Stallone, but I think it's key to the character that he's a man who is so rarely listened to that he doesn't much bother to enunciate anymore. Details of this movie are more dear to me after having slept on it, such as Adrian's sheepish, incredulous admission in Rocky's apartment ("I don't think I belong here") or the way their first kiss causes both of them to crumble slowly to the ground. So much more gentle and intimate than I imagined the movie would be. Rocky: I didn't have no favors from you! Don't slum around me. Talkin' about your prime. What about my prime, Mick? At least you had a prime! I didn't have no prime. I didn't have nothin'! But he quickly reconsiders before Mickey gets too far, and he gets to training. Thank God: elsewise the movie would be over, and also lame. Paulie: You're such a loser! I don't get married because of you! You can't live by yourself! I put you two together! And you - don't you forget it! You owe me! You owe me! 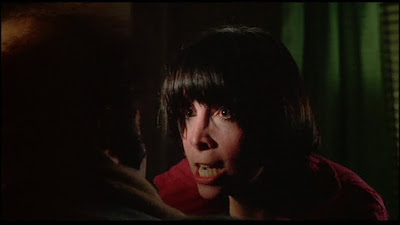 Adrian: What do I owe you!? Paulie: (crying) You're supposed to be good to me. Adrian: WHAT DO I OWE YOU, PAULIE? WHAT DO I OWE YOU? I treat you good! I cook for you! I cleaned for you! I pick up your dirty clothes! 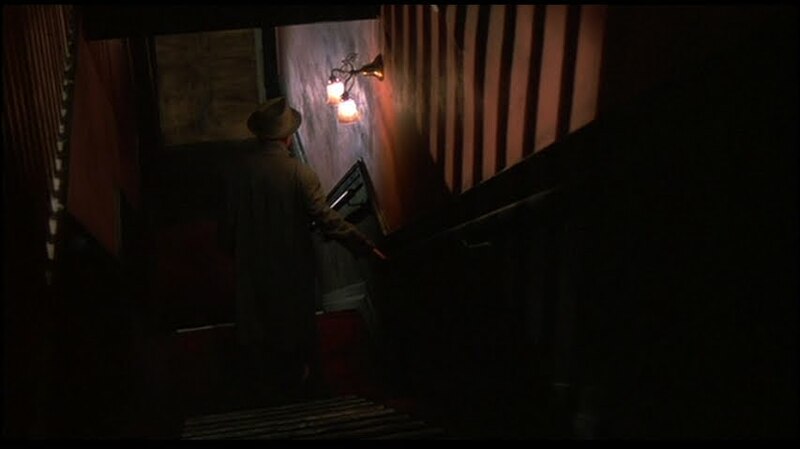 I take care of ya, Paulie! I don't owe you nothin'! And you made me feel like a loser! I'M NOT A LOSER! ... the fight, which ... well, it's a supah-famous scene so I won't spoil it but the ending is satisfying and heroic and heartbreaking and cheer-worthy. 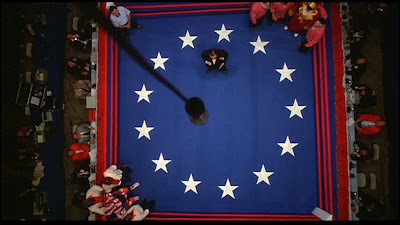 It's interesting to me that boxing usually makes a pretty good sports movie, but other sports have a little harder time. I would suggest that maybe it's because you don't really need to have a working knowledge of boxing to understand the rules. It's fist-to-fist combat. I know it's more complicated than that, but at its basic, primal core, it's a fight, and humans pretty much understand that the guy left standing is the winner. And this ending delivers the best of both possible outcomes. Fascinating. How did I leave liking a sports movie this much? It's not my favorite film of all time but it's very solid. Well done, y'all. Next up: baaaaaaa-bum, baaa-bum, baaa-bum, baaa-bum ... Steven Spielberg changes how everyone on the planet feels about sharks with Jaws.